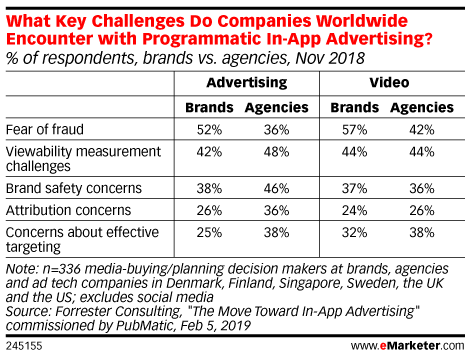 Data is from the February 2019 Forrester Consulting report titled "The Move Toward In-App Advertising" commissioned by PubMatic. 336 respondents at companies in Denmark, Finland, Singapore, Sweden, the UK and the US were surveyed online during October-November 2018. Respondents were decision-makers in media-buying or -planning roles at brands, agencies and advertising technology companies. In addition, four 60-minute phone interviews were conducted with respondents of a similar profile. PubMatic is a mobile programmatic ad technology platform.